The president of a university in Budapest, which says it is under threat of forced closure, says talks on its future are to be held between Hungary's government and New York state. The Central European University (CEU), accredited in the US and Hungary, has been at the centre of a high-profile dispute over academic freedom. The university's president, Michael Ignatieff, says: "We will not close." But Hungary's government says the CEU must "respect the law". The Hungarian authorities have rejected claims that they are trying to shut down the university, saying that the CEU can stay in Budapest if it complies with new regulations for universities with foreign accreditation. But speaking in Budapest on Tuesday, Mr Ignatieff said there had been a "calculated and premeditated attack" on his university. The struggle has taken on a symbolic, political dimension, with protesters seeing this as a battle between a liberal, pro-Western institution and a rising tide of authoritarianism. 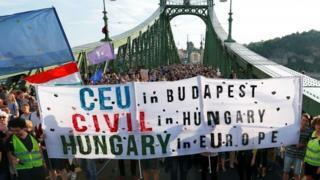 Street protests have been held in Budapest calling for the university not to be closed down. The university is accredited in Hungary and the US state of New York. Last week, the New York governor, Andrew Cuomo, said he was "standing ready" to enter discussions with the Hungarian government in an effort to keep the university open. Mr Ignatieff now says the Hungarian government has taken up the offer and has made contact with the state of New York to begin talks. In a news conference, the CEU president said the "ball is in the court of the Hungarian government". But Mr Ignatieff said the university had no intention of closing or moving. "We're staying here. It's business as usual," he said. He has described the battle over the university as a "line in the sand" and has said academic freedom is an essential part of a democracy. The university claims that the new regulations, introduced in April, are constructed in a way that will be impossible for the CEU to comply. The university says the rules require a bilateral agreement between the accrediting countries - but that higher education in the US does not operate on a federal basis and such a national-level deal is not feasible. The US state department has issued a statement saying it has "no authority or intention to enter into negotiations" over the university. The Hungarian government has faced international criticism in its dispute with the university. The European Commission has launched proceedings against Hungary, with vice-president Frans Timmermans saying new higher education regulations are "perceived by many as an attempt to close down the Central European University". The US government has urged the Hungarian government to suspend its new higher education law, saying it places "discriminatory, onerous requirements on US-accredited institutions in Hungary and threatens academic freedom and independence". Universities including Harvard, Duke, New York University, Princeton, Yale and Oxford are supporting the CEU. But a Hungarian spokeswoman, speaking through the Hungarian embassy in London earlier this month, has said the CEU cannot have a special status that is not available to other universities in Hungary. She said Hungary welcomed overseas education providers, but the CEU was "fighting to keep its privileges". However, the government was "working towards a solution", she said. Another aspect in the dispute has been that the university was founded by George Soros, the billionaire funder of liberal causes. Mr Ignatieff says Hungary's Prime Minister, Viktor Orban, has had a "longstanding vendetta" against Mr Soros. The international university, now ranked in the world's top 100, was set up in Budapest after the fall of Communist regimes across eastern Europe, with the aim of building democratic values.